More than fifty fires are burning in Tasmania. With the forecast for temperatures in the mid-90s on Friday, we decided to go to the east coast. It was a sunny morning, but when we opened the door of our house to load the car, we were shocked to find the breeze was already hot as midday in Tucson. 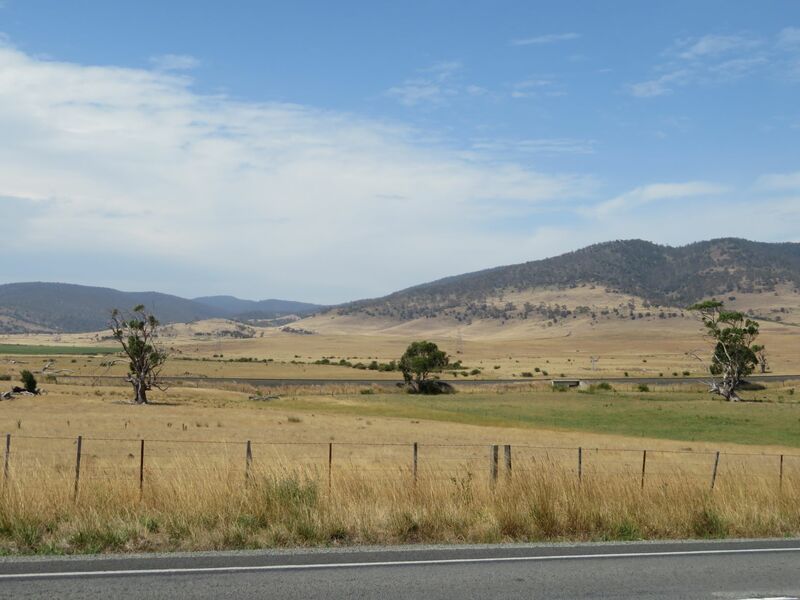 The fire danger is high in our region north of Hobart though there were no fires burning near us. As we drove north and east, a red-edged smoky cloud filled our rearview mirror. We outran the cloud somewhere northeast of Campbelltown. 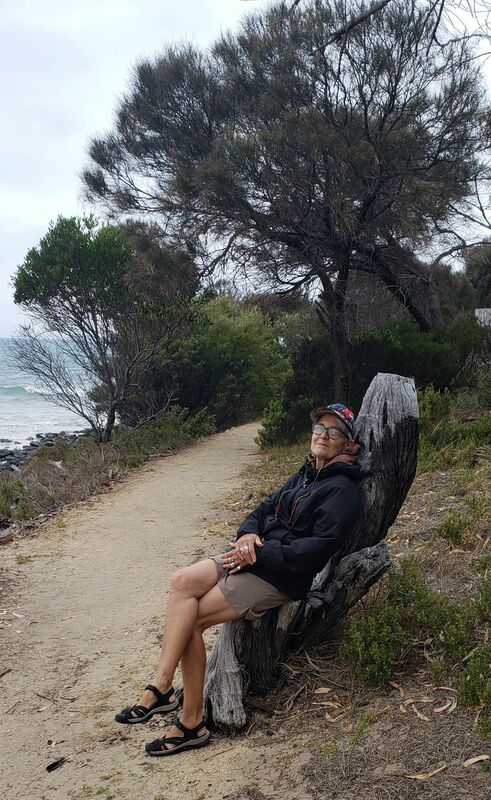 We made it to Binalong Beach, the southern end of the Bay of Fires, named after rocks that can appear flame-red in the setting sun–no burning involved. The beach is postcard perfect blue-green water. Waves crash against soft white sand. The outdoor temperature was over 100° at that point. Our sunglasses weren’t enough to keep us from squinting. We retreated to eat lunch indoors at Lichen, a very good restaurant overlooking the beach. We took our time in the heat but eventually had to leave and decided to go for a swim. 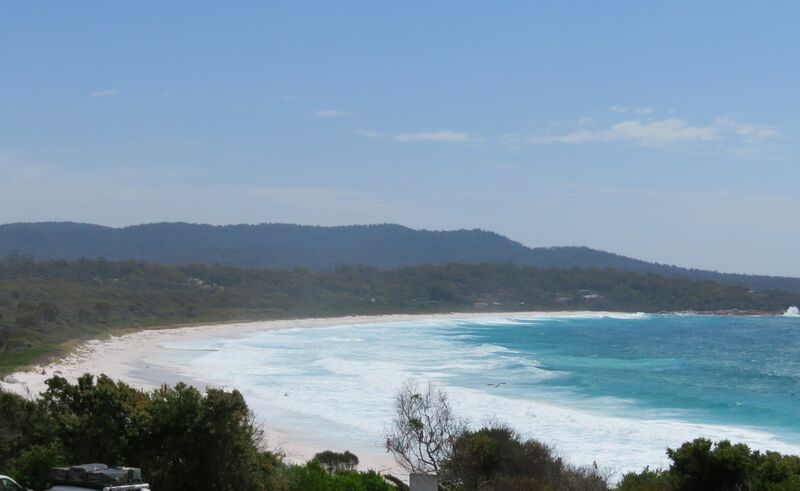 The white sand of Binalong Beach doesn’t get scorching hot the way darker sand does, and we scuffed through the sand in the blinding sun and superheated air until we had to get wet or shrivel up and blow away. The water was cool and refreshing, though the return walk to the car dried us thoroughly. Jonathan had double-checked to make sure we had an air-conditioned motel room, and it was a good thing, as initially we seem to have booked a room with broken AC. That being fixed in advance, we had a smooth arrival at Blue Seas Holiday Villas in Scamander. A week ago, we thought we’d go to Launceston for the weekend and found there were no rooms. It was MONA-FOMA, a massive art and music festival. We postponed our trip and opted for the east coast this weekend, not realizing that THIS weekend includes Australia Day, a major holiday, but we prevailed. The hotel was fine and the manager gave us good advice on where to eat, Fearless Freddie’s Cafe. It was a good day to be on the road, at the beach, in air conditioned restaurants, and air conditioned motel rooms. The air was hot, the breeze was hot, everything we touched was hot. We have been in weather as hot as this in the US southwest, when the temperature edged up over 100 while we were doing archaeological field work. It’s still a pretty rare condition for us, though it sounds like we may experience more days like this during our coming month in Melbourne. Tasmania isn’t usually like this. It’s where mainlanders come to escape the heat–usually. As peculiar as any aspect of our day in the fiery furnace was how quickly it ended. On islands the weather can change rapidly, but I’ve never felt the changes like Tasmania. With temperatures over 100 on Friday afternoon, the wind picked up, a front blew through, and Saturday was completely changed, with temperatures in the high 70s-lower 80s. I was the casualty of this change, with a bad headache most of the morning from the change in pressure. 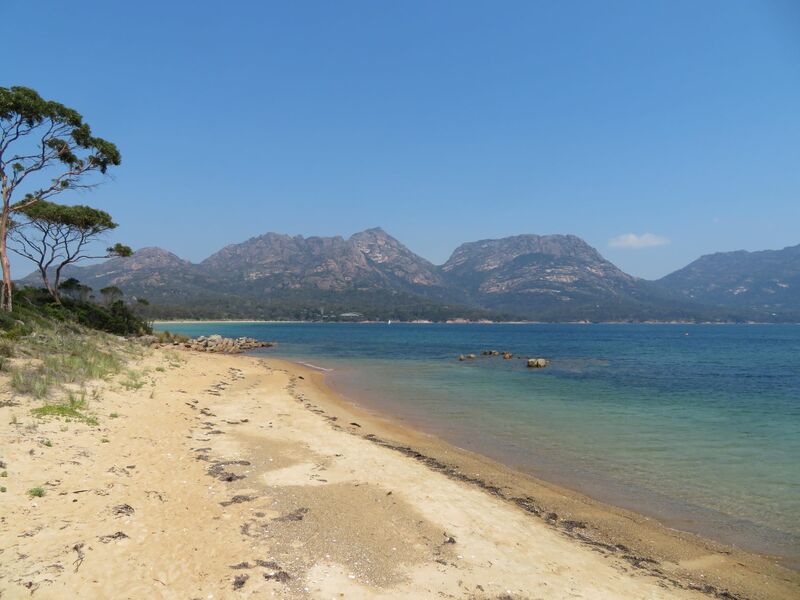 We spent the cooler day visiting spots along the shore between Scamander and Swansea, including a visit onto the Freycinet peninsula. We didn’t make the walk to Wineglass Bay, 90 minutes each way up and down between the hills in this photo. “Everyone” goes to see Wineglass Bay, but there are many gorgeous beaches that don’t require such a hike. Even on one of the busiest holiday weekends of the year, beaches were uncrowded. Late Saturday afternoon we arrived in Swansea. The day had cooled even further, the wind was up, and I was back in my hoodie and rain jacket to stay warm enough to take a walk along the shore. The cool spell was as brief as other weather phenomena and Sunday dawned bright and beautiful. 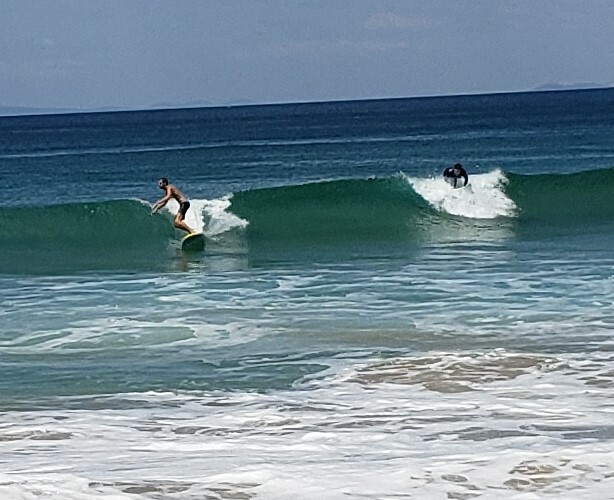 On on way back to Tea Tree on Sunday we stopped at Bolton’s Beach for a last dip, where we had only a couple of surfers for company. There are houses and a campground nearby, and it was glorious weather, yet we were the only people on the beach. We went home happy.